Honoring your students for their successes is one of the best ways to encourage them to continue on in successful behavior in the future, and graduation is the opportune time to publicly recognize your best and brightest. For student council members and officers, wearing an honor cord at their school graduation exercises is a great privilege, a small memento of all their hard work and effort to improve not only their minds, but also their school. Graduation cords inspire a sense of pride and accomplishment in your student council members, and will always remind them of their success in leadership and service. Our honor cords come in a wide variety of colors, including red cords, purple cords, orange cords, blue cords, green cords, yellow cords, black cords, white cords, and even maroon cords. We are sure to have a color that coordinates with your vision for honoring student council members. Many schools across the nation choose to use blue student council member honor cords, and white student council officer honor cords, but there is no restriction or rule dictating how you ought to honor your own student council. 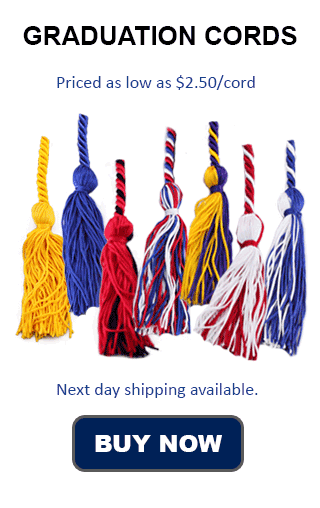 Try a shade that matches your school colors to coordinate with school spirit, or consider an honor cord shade that directly contrasts the graduation robe for an exciting pop of color. Offering your students on the student council a graduation cord to don at their commencement will encourage them to continue being service-oriented and focused on improving the world around them. Graduation cords from Honors Graduation are made from all synthetic material, making them both durable, and visually appealing. Your student council honor cords will shine against the traditional graduation robes, and ensure that your students will stand out for their excellence. Make sure your commencement ceremony has the finishing touch, and reward student council members and officers with distinguishing honor cords.